Retailers risk incurring both brand image and bottom line profit damage if their logistics services partners fail to operate efficient stock rotation processes that minimise the amount of deteriorating or even obsolete stock that they hold. That is the warning from William Walker, sales director leading fulfilment specialist, Walker Logistics. “Third party logistics (3PL) services companies should play a key role in ensuring that their clients’ losses from stock obsolescence or deterioration is minimised,” William Walker says. He continues: “Effective and ongoing stock management routines will allow a 3PL to highlight any stored lines that are approaching their ‘best before’ dates in time to enable the client to find a buyer before it is too late. “If the 3PL has contacts within the market in which its client operates, it might even be able to help identify an outlet for some ageing stock. 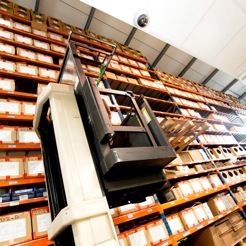 Walker Logistics, for example, works with a number of companies in the cosmetics space and when one recently faced the prospect of being stuck with a significant quantity of none-saleable merchandise we were able to introduce the client to a major discount retailer and a deal was agreed for the sale of the goods. Of course, while asset control procedures will reduce the need to destroy goods, factors such as production or packaging errors, product recall or, simply, a product’s failure to sell before it becomes out of date, will sometimes make destruction unavoidable. “The efficient disposal of waste stock is a fundamental aspect of any successful supply chain,” says William Walker. Walker Logistics offers comprehensive and secure destruction services with audit trails and all the relevant paperwork that demonstrate that products have been disposed of in the most ethical and environmentally friendly way. “There is more to a successful supply chain than simply storing and delivering the goods,” concludes William Walker.